De-cluttering and organizing your space helps to eliminate the physical and mental clutter in your life and mind that is robbing you of your of vitality and productivity. Islam encourages us to be neat, to be organized and to strive for excellence in all things. In the seerah of the Prophet Muhammad (peace be upon him) we can see that he was organized, efficient and productive. Allah does not like disorganization nor laziness. It’s a myth that some people are born with an organizing gene or are natural organizers and others will never be organized. The honest reality is that organized and productive people have learned skills and made it a habit of being organized! Now that we all can form the habit of being organized its time to roll up your sleeves and get in there!! If you want to be a successful Productive Muslim you need to be on top of your game! Let me introduce you to the 5s Method. The most effective, simple and easy to remember technique! 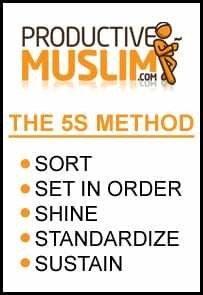 The 5S method was originally developed in Japan and can be applied in just about any environment. Giant Companies,have taken this kaizen technique and applied it to their workforce, because its simple,and keeps everything efficient. Implementing the 5S as a part of our daily life can improve efficiency and productivity tremendously. Sort through everything. Pick one place in your life that is cluttered and unorganized and spend 10-15 minutes every day de-cluttering and being more organized. Get rid of anything that is broken, is never used, is outdated, or is not needed. Keep only what is needed and sell, donate, recycle or throw out anything that isn’t needed! Find a place for everything, including your car keys. Organize and put away everything where it will be most efficient and can easily be found. Store items used for the same task together. In this way, things would never be lost and it will always be easy to get the things you need with as little effort as possible! Clean the area and place all the things neatly. Don’t dump. Make it neat and spotless. This is extremely important. You must have a procedure that will ensure that your environment is kept ordered and neat. Example have a procedure in place that a few minutes daily you will neaten up and put things in their rightful places. Or a procedure that every evening, you will spend 10minutes sorting out your papers or homework. Also have procedures in place, that everything has a place and when an item is used, it should be put back in place immediately. Establish procedures for yourself, for your kids. Having procedures will ensure that you will be able to keep things organized always and will help with the next S.
Okay so your environment is neat, uncluttered and organized. Once the first 4 S’s are complete, the most important thing is to keep it that way. Easier said than done, but it is possible and this is what makes you efficient. Monitor it and make organization and efficiency part of your habits and clutter and disorder would never be able to settle again. Make the 5 S a habit! Remember don’t expect to get organized overnight. Unless you’re really fast at it, or it’s a small area. Don’t have high expectations by getting all organized and few days later you are back to your old mess. Take it slowly and stick with it. Organization is a habit just as being disorganized is a habit.Don’t worry if you’re not “perfectly” organized, as long as your area is in order and neat and reasonably efficient for you. Start today, start small and start with the most important. Strive to develop the habit of being organized and you will be amazed at how much more productive you will become. Implement the 5S today and everyday. Remember Allah loves proficiency and excellence in all things! Implement the 5S, it’s guaranteed to make you more proficient and productive!